I used to be way into kung fu when I was a kid.Â It was exotic, it was cool, who wouldnâ€™t like it?Â Of course, I never tried doing anything with it other than reading a couple of books about it.Â My life is just as fulfilling now as it would have been with a background in the martial arts, so Iâ€™m happy with the decisions that Iâ€™ve made.Â Now thereâ€™s a chance for you to catch that kung fu fever for yourself. 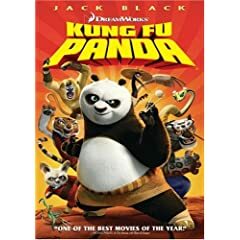 Starting this November 9th, now available on DVD from DreamWorks Animation Home Entertainment comes the hilarious story of an out of shape panda who joins an elite fighting squad.Â Kung-Fu Panda is ready to leap out of your television screen and roundhouse kick your heart into submission.Â Bring home this hilarious and entertaining film today! Po is a panda who loves kung fu.Â His father wants him to take over his noodle shop someday, but Po dreams of becoming a kung fu master.Â When it is announced that a new Dragon Warrior will be anointed to fight the battles some see coming in the future, it ends up being Po who is anointed the Dragon Warrior.Â He has no training and so must go and be taught by master Oogway and the Furious Five.Â All of this builds up to a final fight against the evil tiger.Â Will Po and good find a way to triumph?Â The vocal talents used in this film include Jack Black, Angelina Jolie, Dustin Hoffman, Jackie Chan, Seth Rogen, David Cross, Lucy Liu and Ian McShane. The special features included in this DVD are an optional audio Filmmakersâ€™ Commentary, a featurette that finally allows us to Meet the Cast, finding new ways to try Pushing the Boundaries, a look into Sound Design, the delightful â€œKung Fu Fightingâ€ Music Video by Cee-Lo, a great look into Mr. Pingâ€™s Noodle House, an entertaining way to learn How To Use Chopsticks, a plea from Conservation International to Help Save Wild Pandas, a deeper look into the Dragon Warrior Training Academy, fantastic Printables & Weblinks and a great DreamWorks Animation Video JukeBox. David Cross and Seth Rogen are wonderful to have in this film for comic relief.Â This is yet another DreamWorks film scored by Hans Zimmer and itâ€™s maybe his best one yet.Â Also, this film is far more technical and detailed than any other animation that DreamWorks has attempted yet and the results are simply amazing.Â The colors and animation were striking and the film was very entertaining.Â Not only that, but the story is a very entertaining one with some great messages for young kids.Â This film only continues the meteoric rise of Jack Black as an actor who is someone who can be trusted to make a movie hilarious. This Kung Fu will knock you out! 2 users commented in " Movie Review: Kung Fu Panda "